E|MERGE: Interdisciplinary Collaborative Residency is a two-week long creative residency taking place each winter at Earthdance. Performance and visual artists, activists, scholars, and those interested in developing new forms across disciplines and backgrounds come together to explore new modes of creation and collective decision-making processes. Through structures that allow for risk-taking and the interchange of ideas, E|MERGE provides a fertile space for pushing the boundaries of leadership and hierarchy, and undoing assumptions about creative processes. 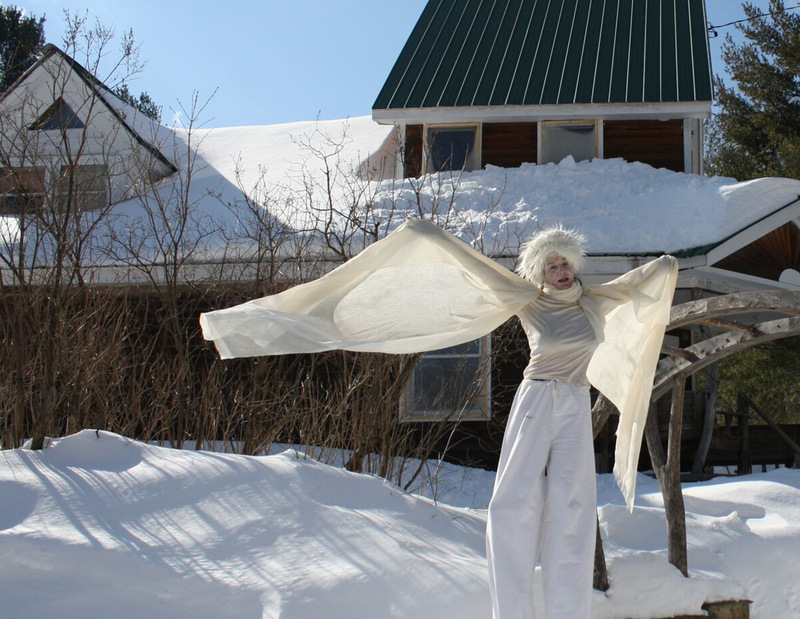 Through the course of the residency, participants are able to access Earthdance's beautiful dance studios, cabins and other spaces for installations and performances, extended hill town creative community, and over 125 acres of (snow-covered) meadow and forest. The residency culminates in a final weekend of performances, panel discussions, writing, research, and other modes of expression called E|MERGE Presents from February 26-27. E|MERGE 2016 is curated by: Shelley Etkin, Gregor Krammer, Cory Neale, Latasha Wright, and Sarah Young. The primary goal of this process is to use choreography as a praxis for building new worlds. Our movement histories and futurities will be crafted through a foregrounding of politics that then draw out various histories, narratives, landscapes, bodyscapes. If choreography can be defined as an "aesthetics of change" (see Michael Klein's "Choreography as an Aesthetics of Change"), we will build new political possibilities both by foregrounding anarchism in our movement processes, and by looking beyond impositions of monological theme. Our bodily inquiry and collective imagination will build suggestive worlds on collaborative process where both our individual and collective histories, presents, and futurities, cross, intersect, and join. enough people can communicate with each other? Will we mimic many autistic brains and rely heavily on one modality to survive? What would that look like in the developing hierarchy of the group? We plan to look at the viabilities of psychic sharings, tiny riots, occupying multiple spaces at once by operating as a moving hydra of intention and thought. We are interested in creating different models for collaboration that organize laterally rather than vertically. We would like to develop a number of workshops that approach concrete problems with mushy solutions that allow for dissent, digression, and honorable confusion. We are also interested in opening a dialogue with all participating artists focused on new strategies to approach the politics of gender, race, ability, and class in various performative states and situations. We will lead and follow. We will become and undo archetypes as necessary. We will give space for the mother, daughter, lover, grandmother, two spirited healer, multi-spirited being, mythical being, ancestrial aliens, and all as yet unimagined roles that could free the pathways of body and mind.